In the database-first development approach, you generate the context and entities for the existing database using EDM wizard integrated in Visual Studio or executing EF commands. EF 6 supports the database-first approach extensively. Visit EF 6 DB-First section to learn about the database-first approach using EF 6. EF Core includes limited support for this approach. Use this approach when you do not have an existing database for your application. In the code-first approach, you start writing your entities (domain classes) and context class first and then create the database from these classes using migration commands. Developers who follow the Domain-Driven Design (DDD) principles, prefer to begin with coding their domain classes first and then generate the database required to persist their data. 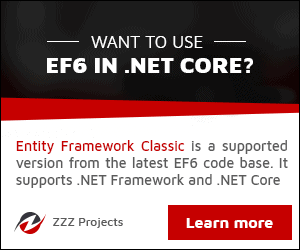 Visit the EF 6 Code-First Tutorials section to learn EF 6 code-first development from scratch. Visit EF Core section to learn about the code-first approach in EF Core. In the model-first approach, you create entities, relationships, and inheritance hierarchies directly on the visual designer integrated in Visual Studio and then generate entities, the context class, and the database script from your visual model. EF 6 includes limited support for this approach. EF Core does not support this approach. As per the above figure, if you already have an existing application with domain classes, then you can use the code-first approach because you can create a database from your existing classes. If you have an existing database, then you can create an EDM from an existing database in the database-first approach. 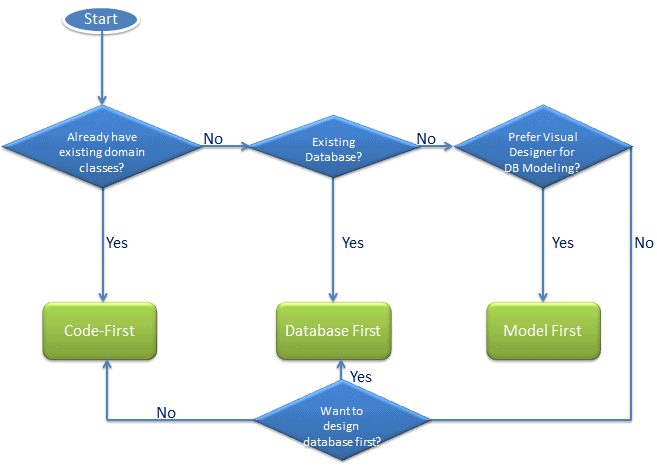 If you do not have an existing database or domain classes, and you prefer to design your DB model on the visual designer, then go for the Model-first approach.